Two major turbine manufacturers specify Temp-Tite II as the sealant of choice for their equipment. Temp-Tite II is a plastic, high-solid sealant extruded into rope or string form and applied to a joint face, making it possible to seal complex joint designs without a pre-made gasket. Sealant is suited for sealing rough or irregular joints of turbines, boilers, heat exchangers, compressors, pumps, blowers, piping, or a variety of other high temperature/pressure metal to metal joints. 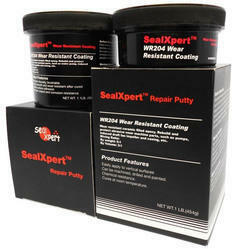 During joint assembly, sealant will flow into rough or irregular surfaces to provide a durable seal. Temp-Tite II expands under heat and cures to a leathery like consistency, and will not crack due to thermal cycling or vibration. Joint disassembly is easy, as the sealant does not excessively harden which allows for quick separation. We are the leading and prominent Manufacturer, Exporter, Importer, and Dealer of Quick Steel Putty. Applicable to watercrafts, machines, automobiles, mining machinery etc. Hand-held dual cartridge epoxy adhesive dispensers are ergonomically designed for the hand delivery of 2 part adhesives in 50 ml, 200 ml, 300 ml, or 400/490 ml cartridges. 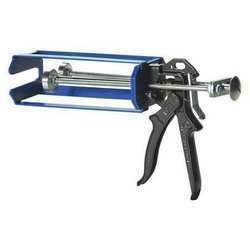 Whether you select a Loctite® manual epoxy dispenser, heavy duty caulking gun, or pneumatic dispenser, each dispenser is designed for rugged use and ensures quick and simple application of your epoxy adhesive. Pneumatic Applicator for cartridges, sachets and pouches. The Airflow 3 provides fast, effortless application of low to high viscosity sealants and adhesives. Designed for industrial, constructional and automotive applications, Airflow 3 offers substantial productivity gains over manual applicators, where compressed air is available. Precise control with the built-in regulator to set speed. Inbuilt air regulator provides smooth consistent flow of sealants. Designed and made in the UK for assured quality. Can be drilled, tapped, machined or painted. Applicable for repairs to machineries and equipment that can be precision machined. Applicable to watercrafts, automobiles, machineries in petrochemical, power plant etc. Used for leakage stopping for water machineries, watercrafts repairing, mines and buildings etc. Bronze -filled two-component epoxy putty. Applicable to watercrafts, machines, automobiles, mining machineries etc. Applicable to general machines, automobiles, airplanes, watercraft etc. 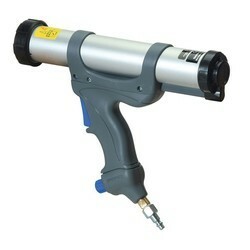 A range of sealant guns suitable for different applications. A Sealent gun helps you to apply a nice even line or can be used to fill in gaps. A solid frame holds the tube firmly whilst allowing easy loading. Also known as caulking guns, most guns fit the most popular sized tubes of 310gm but some do hold tubes as large as 400gm. For the perfect application, screw the nozzle onto the tube, load it into the gun, then squeeze the trigger gently until the sealant appears in the nozzle. Put the nozzle against the job on the angle the nozzle is cut then lift the handle slightly and squeeze the trigger as moving the gun in a smooth line. Moving too quickly will stretch the bead and applying it too smoothly it will distort. We import Coplatite Sealants from USA. Coplatite High Temperature, High Pressure Sealant. Outperforms Any Sealant on the Market Today!The United States Government, along with many industries world wide, has proven Copaltite an unequaled sealing agent. Wherever a packing is required against pressure, heat, cold, gases, acids, Freon, oil, benzene or gasoline, Copaltite is the premier product on the market. Under the most exacting conditions, Copaltite out performs any other product. It adheres readily to surfaces and its elasticity guarantees a perfect seal against vibration, expansion and contraction leaks. For sealing threads, flanges and other fittings exposed to high temperature and pressure, Copaltite is unexcelled. Copaltite is for rough surfaces, warped flanges or unfinished parts. It is a thick paste with a coarse texture which allows for it to fill gaps in scored, uneven surfaces. Copaltite Cement is also used as a gun grooving compound. The Cement form is available in a 1 quart can or a 5 ounce tube. is used for threaded connections and machined surfaces. It is a smooth paste that is easily spreadable. Although normally used without gaskets, Copaltite Liquid makes an excellent gasket dressing. The Liquid form is available in a 1 quart can or a 5 ounce tube. is for rough surfaces, warped flanges or unfinished parts. It is a thick paste with a coarse texture which allows for it to fill gaps in scored, uneven surfaces. 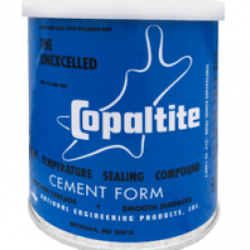 Copaltite Cement is also used as a gun grooving compound. The Cement form is available in a 1 quart can or a 5 ounce tube. 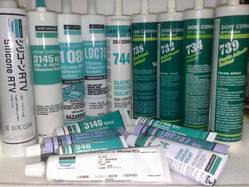 Looking for Speciality Adhesives & Sealants ?